I’m sure there’s one thing that we can all agree on: scorching summer days are intolerable without decent air conditioning. No matter how many fans or cool drinks one can have at home, a decent AC unit is second to nothing else. Everyone knows the difference between stepping into an air-conditioned room and stepping out into the sunshine – comfort. Having an air-conditioned home brings many distinct advantages. Home air conditioning is proven to increase productivity in the home. Everyone knows that sleepy, overheated feeling when you feel like you cannot do an awful lot due to overheating. Well, AC units eliminate this. They not only increase day-time productivity, they also increase the quality of sleep in bedrooms. We all know how much a good night’s sleep can affect us: our health, our moods and our general sense of well-being. Of course, depending on your personal climate zone, air conditioners can also be used as heaters during the colder, winter months. However, with so many on the market, it can be difficult to know which one to choose: What size? What features? How much is it reasonable to pay? This is where we will come in. Our thorough research and reviews will take all the legwork out for you and present it here in one cool split air conditioning buying guide. Types of ACs: Which One Is Right for You? What to Look for in the Best Split AC? Reading online reviews can sometimes be a bit of a minefield. How do you know who you can trust? In my opinion, it’s a bit like reading trip-advisor reviews on hotels and restaurants: sometimes the reviews are convincing and are backed by solid, hard evidence. At other times, they sound like the reviewer is just there to make a point or a complaint without any evidence to back it up. The ones I come to trust when I am carrying out research are the people and the companies who deliver thorough evidence-based facts time and time again. As for us, we have been carrying out our methodical product research for over five years. We have our methodology down to a tee, with the sole aim and purpose being to help you (our readers) by choosing the product that is the right one for you. In terms of our Split AC research, we have reached our conclusions after over 96 hours of research and include several people in the process in order to eliminate and subjective or biased reviews. We also review different brands of products; we are not biased towards and don’t attempt to promote any particular brand. For instance, as mentioned, we have reviewed over 12 different brands and more than 50 products before shortlisting the best 18 to investigate further. From those 18 we selected the top ten and have ranked them in our order of preference. We have even selected picks for all kinds of users, from professionals to home users. So, no matter who you are or why you’re looking for the best split AC, you will find reviews and products that are ideal for you. There are several different types of ACs available, but before you read on, you should have a look at which type of air conditioner would be right for you and your circumstances. Primarily there are four types: Split-Type ACs, Window-Mounted ACs, Portable ACs, and Central ACs. Firstly, Window Air Conditioning units are best for places where you may need to change the location of the unit such as rented homes. They are ideal for small families or small businesses. Portable ACs are the ideal unit for transporting to multiple locations or for temporary use such as dorm rooms, motels or other small-spaced locations. Because of their portability, they generally have poorer cooling efficiency but are most useful for students or travelers or if you have a more active or even unstable lifestyle. Central ACs are large units that are installed outside and cool the home or buildings through ducts and vents. Of course, these are big and expensive and require a lot of modifying in the home or business to set them up. They are ideal for cooling whole office buildings or apartment blocks but, in reality, are impractical for a single family or just for personal use. A Split-Type AC is the best of both worlds. Split-Type ACs are easier to install than the Central AC systems but a bit more complicated than the Window-Type Air Conditioners. They have a high energy efficiency and come with a remote control and other useful features such as sleep mode and auto-restart. If you want an AC in a permanent location in your home or workplace, then Split-Type ACs are the best type of air-conditioning unit to go for. If you’ve come to the conclusion that a Split-Type AC is the best choice for you then how do you know what to look for? How will you determine the future running costs of such a product, for example? Well, firstly, take a look at the SEER and HSPF ratings of the products. These ratings determine how efficient an AC unit is and therefore help you work out the affordability of it in terms of running costs. The higher the SEER and HSPF ratings, the more energy efficient the product is. Next, you should consider its Cooling Capacity. This is something that we will look into in more detail later but, simply put, the cooling capacity is what will determine if the unit is the right one for you and your home or room. If you buy an AC with a low BTU, it might not be sufficient if you have a large room that you want to cool or heat. Check out the next section for more information on BTU. Check out any of the units certifications: ETL, AHRI, and EnergyStar Certifications can all give you an assurance of quality and can provide the guarantees you need. Finally, look for a decent warranty. It’s always best to seek a product with the highest level of warranty cover. ACs are pricey appliances and you’re much better to be safe with a good, long-lasting warranty than be sorry further down the line if anything goes wrong. BTU stands for ‘British Thermal Unit’ and is a quick and easy way of letting you know how much heat or cooling a unit can emit per hour. In ACs, the BTU is used to measure the amount of heat that the unit can remove from a space per hour. Before buying an AC, it is important to determine exactly how much cool air or heat a room needs for the AC to work effectively so that your space does not become too cold or too hot. Please see the table below to help you determine the BTU power that you would need in your desired room in order to maximize its efficiency. As you can see from the table, it’s important to work out the square footage of your room in order to have the correct cooling size. Furthermore, you should also consider the sun’s position throughout the day and its effect on the heat of the room. In rooms with excessive sunlight, a 10% addition should be made to the recommended BTU output for the room size. Warmer climates also typically need 10%-20% more BTUs than cooler climates. Additionally, rooms that have a lot of electrical equipment, such as computers or cooking appliances will also need further cooling output. For kitchens, it is recommended that you add an additional 4000 BTUs to the number in the table above for your room size. Also, if your room has an unusual layout or high ceilings you should consider additional BTUs from the number stated above to compensate. If your room regularly has many people in it, you should add an additional 600 BTUs per person. Generally, an AC with 7000 BTUs is probably the minimum to cool a small room on a hot day (just under 200 square feet). Medium rooms (250 square feet) need about 9-10,000 BTUs. You may use two or more ACs together for larger spaces, such as offices if your requirement is over 15000 BTUs. At the end of the day, if your AC unit is too small for your room then it will not fulfill its purpose, too large and it will cool too quickly without being able to remove the extra humidity properly. You’ve to keep this in mind when hunting for the best split AC out there. In order to choose our Top 10 Split Air Conditioners, we first decided what our criteria in terms of the important features of a split type air conditioner were. We looked through over a thousand user reviews in order to determine our most important criteria in finding an AC. Next, with this in mind, we analyzed the details of over 50 different products, coming up with a short list of 18 candidates. From here, we visited their websites, read their product descriptions in immense details on different store pages as well as reading any individual critiqued reviews that we could find. With these 18, we were looking at a total of 12 different brands and we looked at these in making our decision for our top ten ACs by doing side-by-side comparisons of their features. We then had a diverse group of volunteers who all tested these products in their homes. In comparing the final reviews of our volunteers, we matched them against our research data that we had sought from the web. To ensure that our research and information is robust, we analyzed and tested the different capacities of ACs to learn as to whether they were actually working well in their respective recommended areas. We found that the features tended to remain the same across the different capacities, with only a few minor differences. As a result, when we made our comparison, we chose 12k as the standard capacity and compare all the products in this capacity range. As such, the prices, features, and dimensions mentioned in these reviews are all for the 12k BTU/h models. Once we had sourced all of our data and independent consumer reviews and research, we selected our best 10 products, which you will find here in one helpful handy guide to aid you in your choice of the best split AC on sale today. If you would like to see our detailed analysis report, then please like one of our social media pages to gain access. There you will find a wealth of information and statistics all in one handy report. In compiling our Top 10 Best Split AC list, we have looked for 40 positive features that air conditioners tend to have. The majority of these features were taken from the list of features specified on the product manuals and specification sheets. The additional features were the ones that may not have been mentioned in the user guide but are equally important for you to know about and to have in a decent AC system, whatever the type. We have also considered the pricing for all of the products, looking at the ones that provide the best value for your dollar. Finally, we have considered the frequencies of the reviews of each product to ensure that we can find produce accurate reviews for the best ACs of 2018 and ensuring we eliminate older and obsolete models. 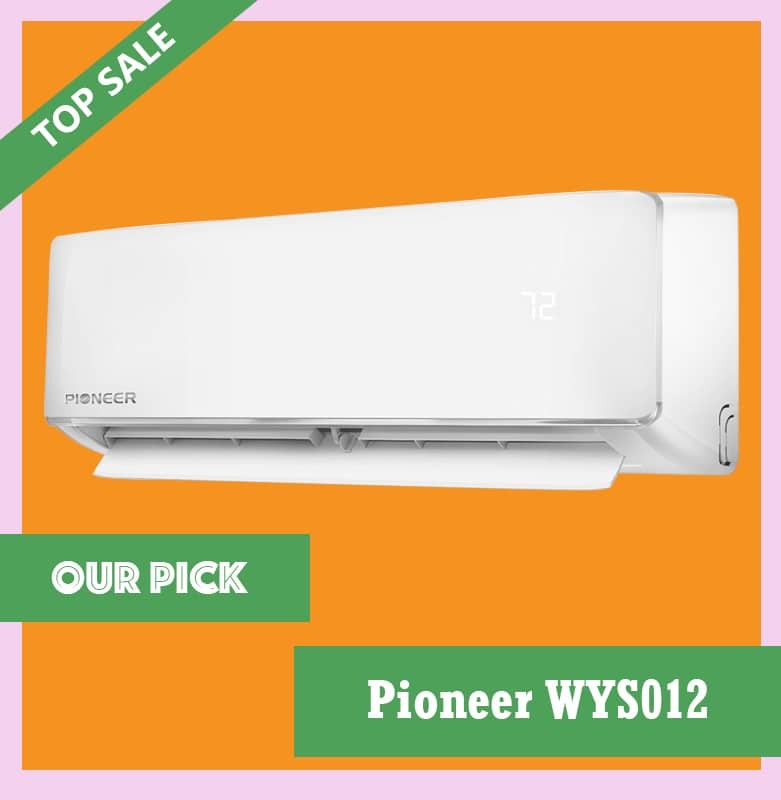 Our Top Pick of the Best Split AC list is the Pioneer WYS021-17. Before I jump into the review, let’s first sum up the reasons why it’s in our top spot as the top split AC that we have found. Why we’ve chosen this product as our Our Pick? This top pick is packed full of features, whilst also coming in at a super-cool and affordable price! It is also a good-looking model that you’ll love to have in your home. the 40 most important features of each of the units we tested, this product contains the highest number of features by having 30, making it the most versatile of all of our reviewed products. In terms of cost, this product is below $750 which makes it a very affordable choice. If we exclude the models that are cheap, bad quality or unnecessarily over-priced, the prices of the Split-type Air Conditioners (12k BTU/h) can range from $600 to $950. The Pioneer WYS012-17 has the highest number of reviews on Amazon and have a great average rating of 4.4 out of 5. It has been receiving 10 reviews in less than a month, consecutively. Compared to the other products in our top ten, this is the highest frequency of reviews for this product range. It is a clear indication of its popularity and how much it is being sold on the market today. This product has different models that can accommodate different voltage inputs. This unique option offers the users a choice on which AC would be better for your home. If you have a power outlet running at 230V you wouldn’t be able to run other air conditioning units without an adapter, making it an economical and safer choice. The Pioneer WYS-012-17 comes in various sizes, making it a suitable choice for larger or smaller rooms. Have a look at our table above in order to calculate what BTU/h output you need for your chosen room. It comes in a 110/120v option in 9k BTU and 12k BTU sizes. The 208/230V option comes in 9k BTU, 18k BTU, 24k BTU, 30k BTU and 36k BTU outputs. 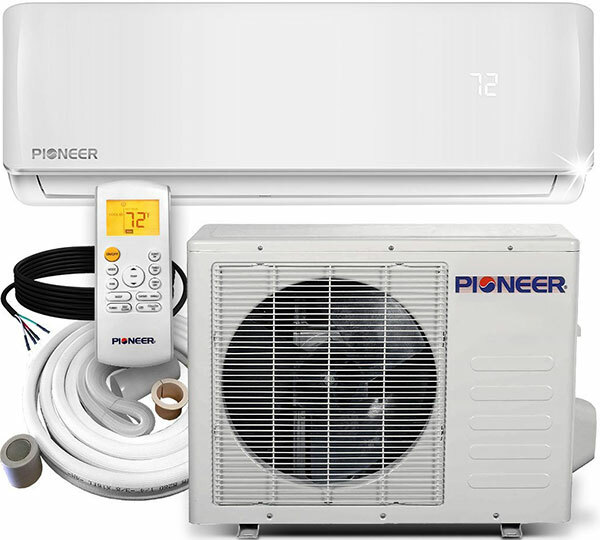 This model is Pioneer’s newest design, which is built with superior efficiency and the latest technologies to provide the utmost performance and comfort for all your home or office air conditioning needs. As mentioned above, it comes in different capacities from 9k BTU to 36k BTU and at two different voltage options, 100/120V or 208/230V depending on your needs. Its flat front panel houses permanent air filters which are washable as well as a range of other filter options. It has automatic swing air discharge louvers and a multispeed fan motor. It is extremely quiet in its build too, boasting to be whisper quiet in its operation. It is made from robust galvanized metal painted with specialist electrostatic epoxy paint with a high-efficiency DC inverter compressor and a ductless split heat pump system. The Pioneer design is extremely efficient. The cooling capacity of the 12k BTU/h has 17.2 SEER efficiency and has a heating capacity of 9.0 HSPF. In terms of temperatures, the indoor temperature setting range is between 62-90°F as well as having a low heat setting (named ‘vacation mode’ of 46°F. As for cooling mode, the outdoor operational range for temperatures is 32-122°F and the heating mode is 5-86°F. The range for capacity is controlled automatically by the sophisticated electronic technology by speeding up or slowing down the compressor in order to meet the exact heating or cooling loads to maintain your perfect conditions in the living spaces all while keeping electricity use to a minimum. As for the latest technologies, it has worldwide remote access through WiFi and a programming module option too. The dongle is sold separately. There is a big backlit LCD display and a multi-function infrared wireless remote control. The remote control allows you to select from four different modes: heating, cooling, ventilation and dehumidifying. There’s also an automatic switchover mode which is controlled via its onboard computer. The timer function lets you set it to come on or switch off at a time of your choice and a nighttime mode adapts the temperature settings automatically throughout the night to reflect the naturally changing temperature of the human body during sleep. There’s also an auto-restart function which memorizes all the settings in case there’s a temporary power failure too! All of the systems in the unit have been safety tested and approved by ETL under UL standards. Performance tests have been carried out and listed by AHRI. Our testers have reported that the installation of this unit is pretty standard in terms of difficulty, so you should be able to manage to install the unit without requiring any expert help! Users have reported that if you have some basic DIY skills and some tools already, then you should not have too many problems installing the unit. However, should you get into difficulties, Pioneer has its own product support helpline, as explained below. The great thing about Pioneer is they have a product support hotline and are able to answer any questions or requests to do with the installation of the product, its use, any troubleshooting or questions about the warranty or issues with the parts. Furthermore, there is a 5-year warranty on the compressor and a 2-year warranty on parts. As mentioned in our reasons, this split-type AC has the top number of Amazon reviews of all our Top 10 Best Split AC reviews with an average rating of 4.4 out of 5. It continuously has at least 10 reviews per month which is the highest frequency of all the reviewed products. It is, therefore, an immensely popular unit, and for good reason! As you can see, we simply can’t top this product. It’s our number one choice for a reason! It is an affordable complete system which is ready to install and comes with a multitude of superior and advanced functions at a very affordable price. Its attractive design will easily blend into your décor and the remote control ensures it is easy to use whether for heating, cooling, ventilation or as a dehumidifier. Why we’ve chosen this product as our Runner Up Pick? This second place air-con has loads of features and is even cheaper than our top pick! Beware it is tricky to install though, so make sure you bring in an expert to help you out. 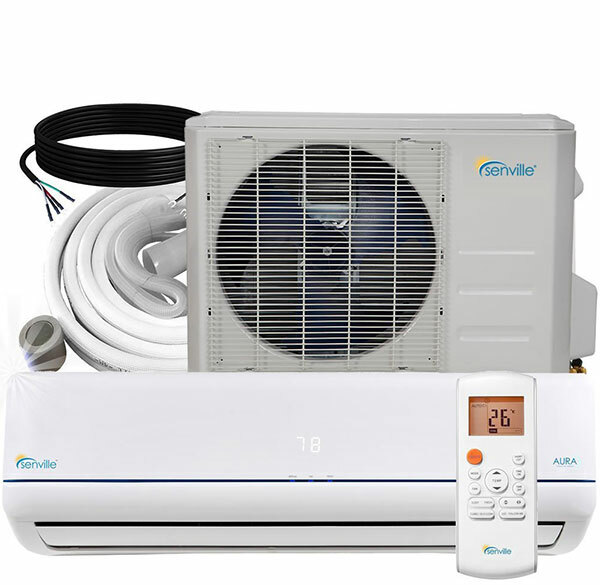 Our runner up is the Senville SENL-18CD Air Conditioner which is tied with our top pick in terms of average rating and similar frequency of reviews on Amazon. Although it almost took up our top spot with a slightly lower price than the Pioneer top pick, it failed to reach the same number of positive features by having 22, hence it becoming our runner up pick. Its reviews are good and it has over 100 Amazon reviews. Considering that only 1 in 10 buyers are taking the time to write a review, statistically, this product sells over 100 units within weeks on Amazon alone! Given how large appliances see more sales offline than online, this is a good indication of having large sales overall. This product is popular and its users are trying to pass on that same message with their positive online reviews. However, the unit is very difficult to install and trying to install it yourself is not recommended. Unlike most of the products in the list, the indoor unit doesn’t come pre-charged with Freon, but the outdoor unit does. The unit is available in many sizes: 9K BTU, 12k BTU, 18k BTU and 24k BTU. 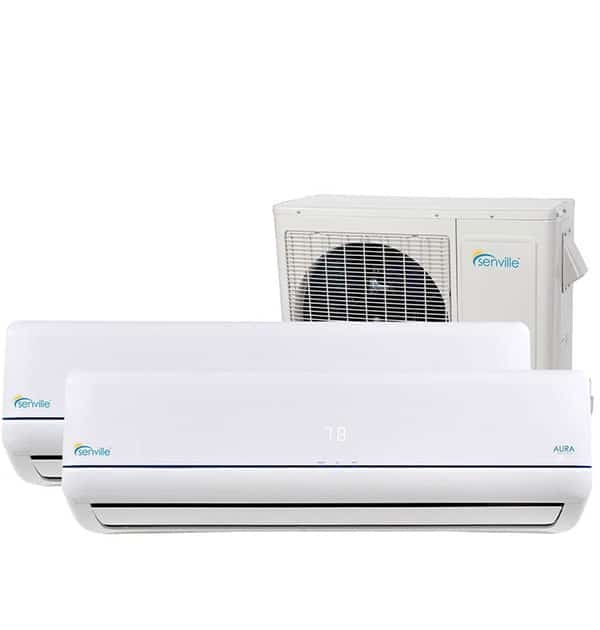 The Senville SENL-18CD Air Conditioner is our runner up, just pipped to the post by the Pioneer above due to the increase in positive features. The Senville is still a front runner, with its great capacity for heating and cooling your home or office all year round. Its design boasts the Inverter technology with multi-directional vents and provides the user with complete climate control. As mentioned, it is available in four capacities: 9k BTU, 12k BTU, 18k BTU and 24 BTU so it is suitable for all types of rooms or office spaces, simply use our calculation table above to work out which unit is best for your needs. The outdoor unit comes pre-charged with Freon coolant but, unfortunately, the inside unit does not. The inside unit measures 31.69 x1 1.22 x 7.64 inches for the 12k BTU unit, but of course, the other units all vary slightly in their sizes. Due to the unit’s Whisper Technology, the unit is ideal for bedrooms and it is therefore very quiet in its operation. The unit has a 15 SEER, though different are available. It can operate at temperatures between 60-86°F and has a 7.2 HSPF rating. It is compatible with Seville external thermostats and has a programmable remote control to regulate your temperatures easily and accurately. The unit is EnergyStar certified, reassuring you of its quality and durability. As well as this it is AHRI certified and ETL certified – exactly what you need for reassurance and peace of mind when buying a large product. Unfortunately, one of the downsides of this unit is its installation. It is very difficult to install and is not recommended by the individual but rather a professional is required to install it. So, whilst it is slightly cheaper than the Top Pick at $719 for the 12k BTU, you do need to factor in a professional installer. However, it does come with all of the kit needed to install it such a 16ft insulated copper line set, wiring harness, and additional accessories. The unit comes with a 5-year warranty on the compressor and a separate 1-year warranty on the parts. As mentioned, it has 22 of our identified 40 most positive features of split AC units which, whilst this isn’t the highest, is above average when comparing our top 10 split AC reviews. It is very well rated on Amazon, having the same number of stars (4.4 out of 5) as our top pick, with a very good frequency of ratings too. Finally, it is very affordable in price, even when you consider the additional costs of professional installation. The 12k BTU size currently retails on Amazon for $719. Our runner up Senville is a very well-rated and frequently reviewed product with fantastic features that make it suitable for the home or small commercial areas. With 4 different capacities available, it really meets consumers’ needs. It is affordable but consideration should be given for its installation as this is not easy without professional help. Why we’ve chosen this product as our Convenient Choice? Arctic air from Mr Cool! Our third pick is so so easy to install, that you can do it all yourself! It is a little more pricey, but has all the features you’ll need to keep your home nice and chilly. Our top choice for convenience is the MR COOL DIY Ductless Mini-Split Air Conditioner. Being a Do-It-Yourself AC, it is extremely easy to install. The user does not even have to call out an HVAC technician to have it installed! In addition, it comes with a fantastic 7-year warranty on the compressor and 5 years replacement parts warranty, making it the joint longest warranty of amongst all of our Top 10 Best Split AC list. Despite it being on the pricier side, the product’s ease of installation makes it very convenient to use. And, with a warranty that good, the user can reliably use it for years to come without the worry of repair, maintenance, or servicing. It is total convenience in an AC all wrapped up in one neat package! Apart from the obvious advantages it has over the other products in our list, it has a decent number of positive features (19) and a great Amazon rating of 4.3 stars out of 5. Although its review frequency is a little on the unfavorable side, it still has the best review frequency in this higher price range. In terms of size, this product is available in 18k BTU, 24k BTU, and 36k BTU making it suitable for whatever rooms you should need. This Mr. 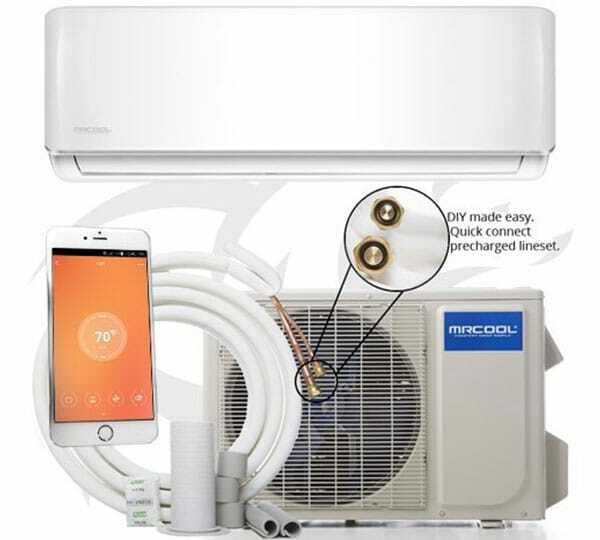 Cool mini split AC system is the only ductless system available on the market today, which is explicitly designed and marketed for amateur installation. It houses a high-efficiency heat pump, with an inverter variable speed compressor and line sets that are pre-charged with refrigerant (R410A). There are quick link-up electrical connections and the high-quality build means that almost anyone could install it in their home, without the additional costs of professional installation too. The cool thing about Mr. Cool DIY AC unit is that you can control it anywhere by using a smart device! There is a Mr. Cool Remote app which can be downloaded on any Android or Apple device! It covers a recommended area of 350-1300 square feet, with the highest temperature of 70°F. Its SEER rating is a very pleasing 17.5 too, which is higher than our first two picks! The unit is ETL listed but we have unfortunately not been able to find any further information on certifications that the Mr. Cool unit has. There couldn’t be an easier AC unit to install than this one. It is suitable for even the most basically skilled DIYers! There is no need to hire a professional fitter or have any specialist tools or equipment. If you’re looking for an easy-install, then this is the one for you. Its entire purpose is to be the leading and only DIY install AC on the market and it certainly meets that criteria! As mentioned, the price of this AC unit is more expensive than our first two picks. However, when you consider that you do not need to hire a professional to install this air conditioner, it could well be the money-saving aspect that you’re looking for! It also comes with an exceedingly impressive 7-year compressor warranty and a 5-year parts warranty, which is better than our top pick and runner up too! Despite having fewer reviews than our first two, it is the top rated product in its price bracket and, as such, is most certainly worth your consideration especially considering it has 19 of our most important features! A little on the pricey side! Want an AC unit that you can install yourself with minimal fuss and a practically unbeatable warranty? Then this Convenient Pick is the one for you! It’s pricier than our other top picks and with fewer reviews, but it ticks a lot of boxes that other split AC units don’t come close to ticking, which has to be worth something! Why we’ve chosen this product as our Budget Choice? At such a low price you’ll be surprised to see that this air-con also comes with a good amount of features. If you’re on a bit of a budget then this is a great choice for you. Our budget choice amongst our 10 best split AC reviews is the Okyotech Ductless Mini, coming in at below $650. Whilst we did have another candidate with a price tag below $600, this one took the prize by having a significantly higher number of positive features (18 as opposed to the 12 of the cheaper item). Above all, this product comes with a whopping 5 out of 5 stars on Amazon. When it’s compared to pricier items, this product does lag behind a bit in terms of positive features, so it had to settle at the 4th position despite its 5/5 rating. The Okyotech Ductless Mini comes in 2 sizes: 24k BTU and 36k BTU. For a budget buy, the Okyotech Ductless Mini is stylish and sleek as well as being non-intrusive. It is placed as an indoor panel design. Furthermore, it is Ozone Friendly and Chlorine Free with R410A Refrigerant Technology and is already pre-charged. The indoor unit is pre-vacuumed too. It boasts four features: heating, cooling, ventilating and dehumidifying, and is fitted with a GMCC Toshiba Compressor. The filters are antibacterial and made from Nano-meter Silver filter technology for a healthier environment in the home. Finally, it is also Whisper Quiet, making an ideal unit for sleeping areas. This unit is very efficient and has 14 SEER high energy technology, which ensures the unit is both reliable and energy efficient. The 3D Air Flow Technology with Smart Heating and Cooling is fantastic. The unit heats from the bottom upwards and cools downwards from the top. It comes with a digital wireless remote control and its temperature ranges from 19.4°F to 127.4°F. It has several additional features, such as a 24-hour timer mode and a sleep mode. In the sleep mode, the temperature is accurately controlled by the deviation of 0.1°F, ensuring a comfortable night’s sleep for everyone. Our budget pick boasts to be ETL-US Listed and Certified, which is reassuring for its reliability and energy efficiency too. 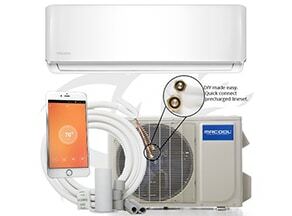 The manufacturers claim that the unit has easy installation and it comes equipped with all the materials needed to fit the AC unit, including a 16ft copper line set complete with connecting wires and cables as well as wall mounting brackets made from heavy duty stainless steel for the outdoor unit, should you wish to mount it. There is also a variety of other accessories that come with the unit to aid the installation process. However, the company does recommend that you employ an HVAC insured and licensed electrician or fitter to complete the job. The Toshiba Compressor comes with a decent 5-year warranty and there’s a 3-year warranty for the unit itself. The price of this unit is one of the lowest that we have seen, which is pleasing. Despite there only being 6 reviews, they are all excellent and rate the product as 5/5! As mentioned, it has 19 of our top positive features, some of which are excellent for a budget product such as the sleep mode. If you are wanting a cheap split AC unit then this one should most certainly be up in the running. Retailing at under $650, it is a great price for such a well-received product on the market today. On top of that, it comes packed with some fantastic positive features too. Split AC on a budget? This one’s for you! Coming in at no.5 this air-con is another top choice. It is designed to be really quiet, so if no noise is important to you, then this Pioneer is a great option. There are 9kBTU and 12k BTU 110/120V models and 9k BTU, 18k BTU and 24k BTU 208/230 V models. Being from the same manufacturer, this pick has a lot in common with our top pick and thus is a fantastic buy. It has a high-efficiency inverter with washable permanent air filters as well as a range of other enhanced filter choices too. It has pre-filled line sets with R410A refrigerant, refrigerant leak detection and has Whisper Quiet fans on both the outdoor and indoor units ensuring silent operation. The perfect conditions are maintained by automatic sophisticated electronics which slow down or speed up the compressor as required. Finally, it is built from robust galvanized metal painted with special epoxy electrostatic paint. The Pioneer units have high SEER ratings between 20.5 and 22.8, depending on their size which is really impressive. They also have a heating capacity with HSPF efficiency ranging between 9.8 and 11.2. The temperature range for indoor is between 62°F and 90°F and there is also a low heat setting (also known as vacation mode) which is set at 46°F. The cooling mode temperature range for outdoor operation is between -5°F and 122°F and the heating mode is between -5°F and 86°F. The attractive unit is controlled with a remote controller with multi-function possibilities. It also has worldwide WiFi remote access and has a programming module (however the necessary Dongle is sold separately). There is an LCD display on the unit that is backlit. All of the Pioneer systems go through robust safety tests and are approved by ETL under UL standards. Furthermore, AHRI has carried out performance testing too. The Pioneer system comes ready to install with all of the necessary attachments. 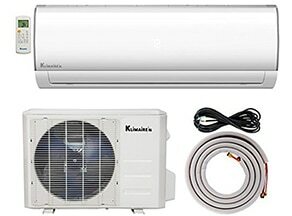 It consists of a ductless indoor unit, a powerful, robust outdoor unit and the installation kit. The installation kit has a 16-foot line set which can be extended or shortened should you need a different length. The kit includes insulated copper tubing including flare connections, signal wiring, putty, wall sleeve cap and liner, drain line extension and wrapping tape. The fact that the installation kit has everything included makes this a more affordable product too. The installation of the unit is pretty standard and, unless you are particularly adept at DIY and fitting such units, you will probably need a bit of assistance from a professional AC installation technician. This unit is further down our list than our other Pioneer, the top pick, due to its price. It comes in at just under $950, making it a bit more expensive than our top pick and budget buy. It does have a good number of positive features (26) making it joint second highest after our top pick, which is pretty impressive! As with our top pick, this Pioneer product comes with an unrivaled hotline for product support to answer any questions to do with installation, usage, the warranty, issues with parts or general troubleshooting. The compressor comes with a 5-year warranty with a 2-year warranty on parts, which is very pleasing. As for reviews, it has so far received 56 Amazon reviews with a total rating of 4.5/5, which is fantastic! This Pioneer product is also a good buy but it is just pipped to the post by its brother with having only 26 of our positive features compared with the top pick of 30. However, it is still a top buy, having an excellent rating and a lot of the fantastic features of our top pick too! If the top pick isn’t the one for you but you fancy a Pioneer for its unsurpassed product helpline, then this may be the one for you. This is one of our picks that comes in at the lower end of budgets. It has a few different modes and some good features, so looks like a nice all-rounder option. The Klimaire KSIF012-H115-S 1 Mini is part of the KSIF series from Klimaire which are AC units designed with oscillating louvers, ensuring that air is evenly distributed throughout the required space. These louvers work alongside the air discharge to ensure that your room feels comfortable and hot or cold spots are eliminated. It has a slim and thin design encompassing a high-efficiency multi-bend hydrophilic heat exchanger and a super-effective blower wheel. This unit also boasts an auto-clean function, cleaning and drying the evaporator in order to prevent any growth of bacteria and maintain a top quality, healthy indoor air. The outdoor unit comes extra pre-charged and can accommodate 25ft of refrigerant lines. It also has a refrigerant leak detection monitor which alerts when there is any leakage to prevent any damage to the compressor occurring. Finally, it has low-level noise operation and does not take up much space meaning that finding a location for the outdoor unit should be easy. It is available in 9k BTU, 12k BTU, 18k BTU and 24k BTU capacities. The Klimaire is a four in one system with cooling, heating, dehumidifying and fan modes. There’s also the turbo function, the oscillation mode, a multi-speed fan, a self-diagnosis function and ‘follow me’ mode. Overall, it effectively cools and heats areas up to 450-550 square feet. The DC inverter technology increases the capacity for cooling and heating at lower ambient temperatures right down to 5°F and therefore can provide as much as a 30% saving in terms of power usage. It also has automatic defrost, preventing any freezing of the condensation and thus eliminating any damage to the compressor. There is a built-in pan heater in the base which makes for reliable heating during the lowest winter temperatures, down to 5°F. It has a SEER of 16 (not one of our best) and an HSPF rating of 9. The unit comes with a remote control, allowing you to set your own custom parameters. There’s also a wall-mounted remote control holder included too. There’s also the option of a wired wall thermostat which can be plugged in easily too. Unfortunately, we have not been able to find any mention of any certifications with this product. The company behind this product ensure that their installation is quick and easy by providing ‘quick hook’ wall hanging with a mounting bracket. There’s also a 13-foot installation kit included. As mentioned, it takes up little ground space and can be easily wall mounted. Being of standard difficult to install, it’s probably best to get a professional technician to do it for you. Unfortunately, there are only 5 Amazon reviews in total for this product. However, the Klimaire does come with 22 of our ideal positive features and the overall rating on Amazon is 4.6/5. It is also one of our cheaper products, with a current retail price of around $720, making it in our top three for the cheapest price. There’s also a 5-year warranty on the compressor and a 1-year base warranty on everything else too! For a product on the less expensive side of the spectrum, this one certainly ticks a fair few boxes. It has loads of our positive features despite being in the top three cheapest of our Top 10 Best Split AC list. Its reviews are positive but there are only five Amazon reviews, which is among the fewest number of reviews of all our Split AC reviews. This is another solid choice for a family home. The Senville is easy to install, has a stack of great features and a good warranty. Be warned it is a little more pricey than some of our other picks! The Senville SENA-12HF/Z Mini comes in three capacities: 9k BTU, 18k BTU and 24 BTU. This Senville is made in a top quality design, attractively presented with powerful and dependable performance. Its DC Inverter uses 208-230V and is Whisper Quiet making it ideal for bedrooms. It has anti-microbial silver ion filters and in-built dehumidifying function. It also has a self-diagnosis mode, a self-clean function and refrigerant leak detection. This super-efficient unit has up to 25 SEER with low ambient cooling and Hyper Heat (up to -22°F) and 10.3 HSPF heating rating. There’s also an in-built thermostat allowing you to control the exact temperature of the room, operated by remote control. It has a recommended area of between 100 and 1500 sq. ft. This product comes with pleasing certifications! It is EnergyStar Certified, AHRI Certified and ETL Intertek Approved too! 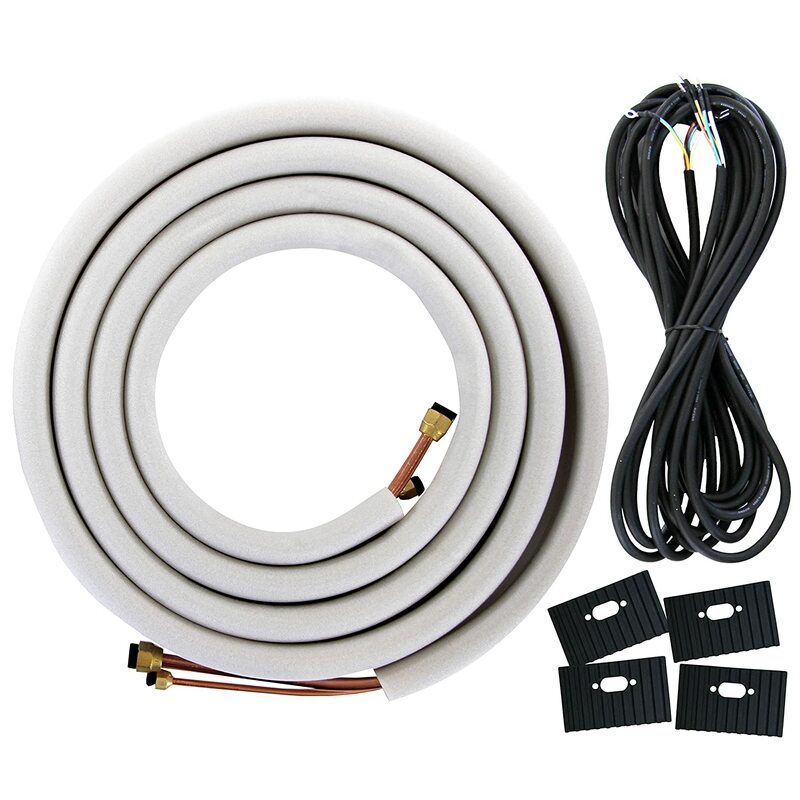 It comes with its own Installation Kit with a 16-foot copper line set and is easy to install. This model comes with 26 positive features, which actually puts it into second place in terms of positive features of all of our top ten split ACs. It also comes with an impressive 7-year warranty on the compressor and a 3-year warranty on the parts. It is slightly on the pricier side compared to all of our reviewed products, hence its position in our top ten. It has 4.3/5 stars on Amazon and therefore is fantastically supported by previous purchasers. This Senville is another great split AC with stacks of positive features and it’s easy to install too. Anyone with basic DIY should be able to manage it without too many problems. It has pleasing reviews and a superb warranty. So, if you’re after reliability, easy installation and great positive features, then this one is the one for you. However, it is one of our more expensive units amongst our best split AC reviews. This model is quite cheap to buy and a good value pick with low running costs as well. On top of that it is easy to install, so you’ll be up and running getting your home cool in no time! This Aircon Mini Split AC is available in four sizes: 9k BTU, 18k BTU and 24 BTU. 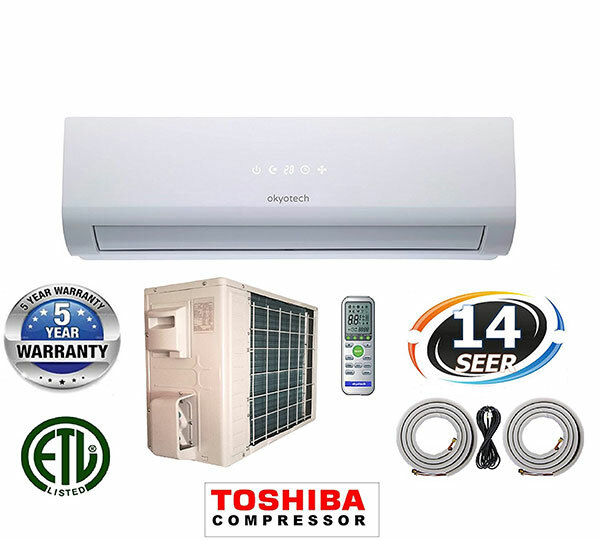 This Aircon Mini Split houses a variable speed DC Inverter Compressor made by Toshiba and powered by 208/230V. It is a cooling and heating mini split ductless AC system. It comes with R410A pre-charged lines and is super quiet in its operation. It also has a durable and robust corrosion-resistant cabinet. IT also has removable and washable panels. 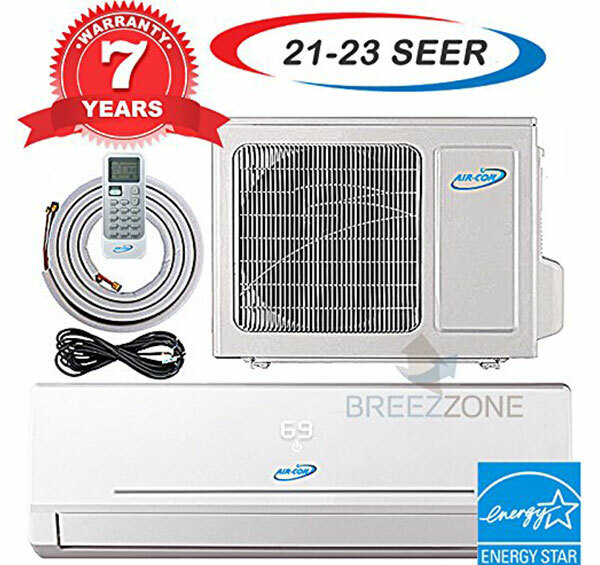 With a 20.5 SEER, this is a very energy efficient product with many excellent features and functions. It has a start-up feature which operates on a low voltage to save you time and money. Its other functions include a sleep mode, self-diagnosis and auto-protection, auto-defrost, self-cleaning, Louver position memory with horizontal and vertical louvers and auto-start functionality. It has a 7-speed indoor fan with low ambient heating and cooling. It has an HSPF rating of 11.6 too. It is operated by an LED display and a wireless remote control as well as a 24-hour timer. The Aircon unit is both EnergyStar and AHRI Certified. Its easy installation means that even the lesser skilled home DIYers amongst us would probably manage to install this AC unit without too many difficulties. It comes with all of the necessary parts for installation too, as well as full operational and installation manuals. This product has the top best warranties of all our reviewed products with an impressive 7-year warranty on the compressor and 5-year warranty on the parts. It really cannot be beaten! It is also one of the lesser expensive models of split AC that we have reviewed without any health risks. It has 23 of our selected positive features and is rated at 4.3/5 stars on Amazon with 11 reviews. This unit has a very impressive SEER rating and is also cost-effective in not only its initial purchase price but also its operating costs too. It has positive Amazon ratings, despite them being relatively few and also has impressive warranties and easy self-installation! A good shout for those on a tight home budget wanting energy efficiency and less power usage. The only 48k BTU capacity on our pick list, this should be your choice if you need to keep a big house nice and chilly. 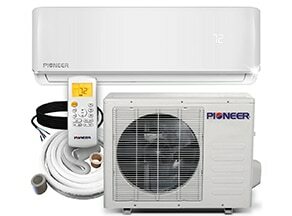 It doesn’t come in cheap, but with this Pioneer you can rely on it to keep even the biggest properties nice and cool. 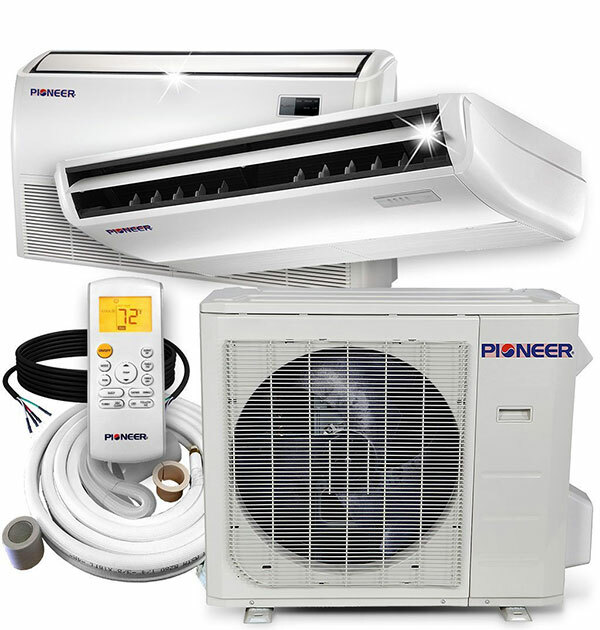 This Pioneer Floor to Ceiling Split Ductless AC with Inverter+ compressor is the one air conditioner in our top ten that comes in a 48k BTU model! The other sizes available are: 18k BTU, 24k BTU and 36k BTU. This is one of Pioneer’s latest designs made with the most up to date technology for utmost efficiency, performance and comfort in your home. As mentioned, it has a large capacity range and is the only product of all of our reviewed split ACs that has a 48k BTU option. Its capacity range is controlled automatically by its superior electronics which slow down and speed up the compressor ensuring that the exact heating or cooling loads are met and there are perfect conditions in your living spaces all while using the least possible electricity. To make this unit even better, it does all this with whisper quiet fans on both the outdoor and indoor units. They come in an attractive design too and are able to be mounted in various ways and locations. The line sets come pre-charged with R410A refrigerant (for lengths between 10 and 25 feet at least). The air filters are washable and other options can also be selected for enhanced filters. These units have a SEER rating of between 16 and 20.5, depending on the capacity and high HSPT ratings between 10 and 11. The indoor temperature range is between 62°F and 90°F as well as a vacation mode set at 46°F. In cooling mode, the operational outdoor temperature range is between -5°F and 86°F. There’s also the option of a programmable wired controller, however, the thermostat is sold separately. All of the systems with this unit have been tested for safety and approved by ETL under UL standards. The performance has been listed and tested by AHRI too. These AC systems come ready with everything you need to install them: insulated copper tubing and connections, signal wires, sleeve liners and caps for the wall, wrapping tape and putty. There’s also a drain line extension included too – various lengths of this are available ranging from 10 feet to 50 feet! Unfortunately, these units come with the lowest warranty time frame of all of our reviewed products with 3 years for the compressor and just one year for parts. Furthermore, the cost of this unit is in the region of $1230, making it a lot more expensive than many of our other reviewed ACs. It also only has 4 Amazon reviews at present, although these are very positive on the whole with an average rating of 4.1/5. The Pioneer products do come with an allegedly unbeatable support line, helping you deal with any problems or issues throughout the life of your Pioneer product. If you’re looking for a large capacity split AC then this is the one for you. It is the only one out of our top ten that comes in a 48k BTU option meaning that it is suitable for even the largest of homes or small commercial properties too. It does have some disadvantages, its price for one, but for a large capacity split type air conditioner, it has to be the Pioneer Floor-Ceiling. Another unique pick in our list, this is the only model that can heat and cool. So if you’re looking for everything in one machine, then this is a good choice for you, although you do have to pay more for these great features. Our last product to make our top ten is another Senville, this time unique or the fact that it is a dual zone AC, meaning it can cool or heat two zones with just one outdoor unit, saving you outdoor space and equally the cost of having to buy two full unit setups. However, it only comes in an 18k BTU capacity. It occupies our last spot mainly due to its price, which has to incorporate the fact that you are paying for two indoor units. As mentioned, this unit is in fact two indoor units connected to one outdoor unit, saving you outdoor space. It is there for an easy and effective way of heating and cooling the home in the same way as a full duct air conditioning installation would but without the hassle. The units have DC Inverter Technology which provides super-efficiency in terms of energy and top performance too. The units have a self-cleaning mode, which means that any water, dirt and even bacteria is removed from the system making the units better for your home and your health. The Silver Ion Air Filtration system also helps the inside of your living space remain clean and there’s also a dehumidifier too. Additionally, due to its Whisper Quiet technology, it is great for bedrooms and living spaces without being too intrusive. This product is very energy efficient yet powerful with a SEER rating of 22.5, which is the joint highest of all our reviewed split ACs. It is one of the best performing on the market as well as being one of the quietest too. The units are ETL Intertek Approved as well as being EnergyStar Certified and AHRI Certified too. For easy installation, this product comes with an ‘easy installation kit’ including a 16-foot copper line set, making it ready to be installed. Of course, with it having two units to install indoors and one outdoors, it may be wise to ask for professionally approved assistance unless you have vast experience in fitting AC units as it is not only a little difficult but also extremely time consuming with more than one unit to fit. The main selling point of this product is the fact that it is a dual product meaning that two rooms in your home can be cooled or heated with only one outdoor unit operating both. This does mean that the product is on the expensive side as you are now factoring cooling two rooms rather than one. It retails at approximately $1800, making it our most expensive product in our top ten. However, despite that, it has a very high rating on Amazon of 4.9/5 stars! Disappointingly, it only has 14 of our positive features, making it the lowest on our list in that category. This product comes with a 7-year warranty on the compressors and a 2-year warranty for parts, which is better than a lot of warranties that we have described. This product is unique in our list for its dual nature. 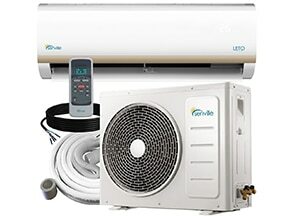 Whilst it may lack in positive features and is the most expensive, the fact that there are two AC units included makes this a very worthy contender in our top ten! SEER: Seasonal Energy Efficiency Ratio. The SEER rating of an AC is how much it can cool during an average cooling season divided by the total input of electrical energy during that time. 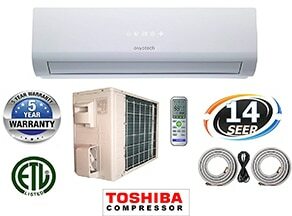 The higher a SEER rating, therefore, the more energy efficient the air conditioner is. ETL: Energy Technology List. This list is part of a government scheme to manage climate change. Being listed with ETL means a product is energy efficient. AHRI: Air Conditioning, Heating and Refrigeration Institute. EnergyStar: EnergyStar is a program launched in the USA, which aids individuals and businesses save money as well as protect the environment by having superior energy efficiency. EnergyStar provides information that is simple and unbiased so that businesses and customers can make informed decisions to reduce their emissions and save money. It has widely become a symbol of superior energy efficiency. HSPF Region 4: Heating Seasonal Performance Factors Region 4. The HSPF is a worth that represents the efficiency of a heat source for the whole of the heating season. Region 4 represents an area of land whereby a certain amount of heating is needed throughout the heating season. HSPF Region 5: Heating Seasonal Performance Factors Region 5. As above, but the region for region 5 needs sufficiently more heat output than Region 4. DC Inverter: A Direct Current Invertor. An inverter’s purpose is to control the speed of the motor in the compressor so that the temperature is well regulated. The DC units have an adjustable inverter to control the motor or the heating/cooling output. The drive converts AC to DC ensuring that current is provided or the necessary frequency for operation. Compressor: The compressor is in the outdoor part of the AC unit and its role is to circulate the refrigerant which is all part of the heat exchange process through the coils in the outdoor and indoor units. It also supplies the energy to the refrigerant. When looking for the best split AC for your needs, there are several things that you should take into consideration. For example, an AC is an appliance that will significantly increase your household electricity bills and so you should think carefully before deciding whether to buy one and, of course, which one to buy. It is important to get this decision right as a good-quality air conditioner can last over ten years. Of course, we have already talked about the sizing of your AC at the start of our reviews. The size of your AC will have the biggest impact on your bills. Assess the energy efficiency ratings of the model you have chosen to buy and consider how this could have an impact on your electricity bills. Remember, you can always like our social media page to gain access to our fully detailed research report. So, there you have it – our Top 10 Best Split AC reviews in one handy place. Now, you should hopefully know not only what it is you need to look for in a split AC but also have some ideas as to what is available on the market for you to buy. Remember, you should first work out what the size of your room is as, if you get that wrong it could all go pear-shaped! But once you have that little task out of the way, it should be pretty plain sailing in choosing the best split AC for you. We have catered for all budgets, all conveniences and difficulties to install so we feel confident that your home will be of perfect temperature in next to no time!